ROPE, HANDKERCHIEF AND RING MYSTERY (Ken de Courcy): A handkerchief is draped over the center of a piece of rope which is tied over the handkerchief. The whole thing is given to a spectator to hold. A ring is vanished and it appears knotted on the center of the rope. AN E.V.T.V. PREDICTION (Arthur Carter): A method to predict basically anything you want: Names, places, cards, etc. The principle can be used for many other routines. DICE CHOICE (W. Rory Coker): Two ESP cards are removed as predictions and two are selected by a spectator. These symbols match your predictions. WHIRL (Aldo Colombini): A transposition of two cards. A REVERSING REVERSE (Pancrazi): A card is freely chosen and replaced. You cut the deck into four packets. The cards are shuffled face up and face down. Despite all the mixing, when you spread the cards only the selection is reversed. 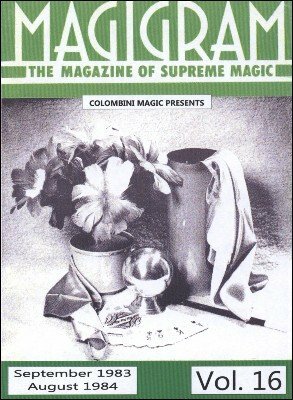 TWO-TIMES-FOUR CARD TRICK (Herb Rungay): Revelations, transpositions and changes are all climaxes of this beautiful routine with a regular deck of cards. LOBBY (Aldo Colombini): A noted card is placed on the table while two other cards are selected and replaced. The card on the table is thrown into the deck. The card is face up between the two selected cards. AN ODD THING (Ken de Courcy): A nice routine where you predict the outcome of the effect. LUCKY ACES (Aldo Colombini): A selected card appears between the Aces and takes the place of the Ace of the same suit. The Ace is found at the position indicated by the value of the selected card. MESSAGE PLATES (Arthur Carter): A message (name of a card, name of a person, place, ESP card, etc) appears between two cardboard picnic plates. Unique idea that can be used for many routines.